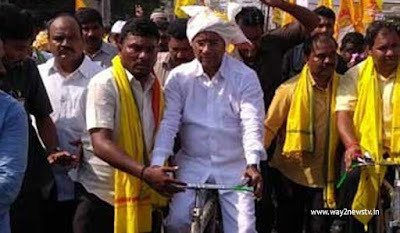 AP Assembly Speaker Kodela Sivaprasad held a cycle yatra on Thursday. In support to the Dharma fighting strike which is going to held by Chief Minister Chandrababu on friday,Kodela held cycle yatra for special status to AP. Kodela cycle yatra started from the Narasaraopet to kotappakonda, along with the activists,People.Thousands of people along with Vinukonda MLA Jeevan Anjaneya were participated in the rally. Speaking on this occasion, he requested everyone has to declare solidarity for the CM Chandrababu's dharma fight . Until the center came down, it was clear that the fighting was going on. There was a slight risk happened at the time of traveling. As the activists blocked, the Speaker came down from the bicycle. Activists and leaders were said to stop the yatra but the Speaker again started a cycle yatra.He started cycle yatra as state future,ambitions are important than the beatings.